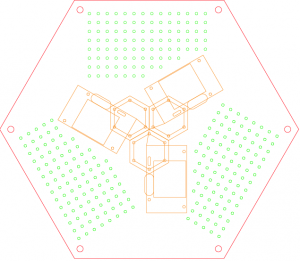 This is a somewhat belated post but I eluded to the fact that there was a podcast in the works featuring @Spetku and I regarding our work on our Delta robots. Pawel and Suz over at SYN Shop produced an excellent first podcast showing off our projects as well as a fly-through tour of SYN Shop, the Las Vegas Hackerspace! Sarah and I are featured in SYN Shop’s first upcoming podcast. I’m told it will be ready for viewing soon! Sarah and I lubing up for the podcast. In part one, I talked about what a Delta is and showed my 3D printed articulating Delta arm. 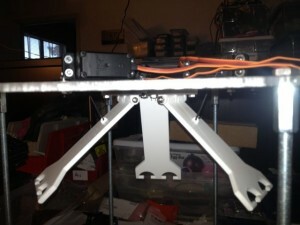 Since then I’ve created a frame to hold the arm and mount motors to it. I used Adobe Illustrator to create the artwork for the top and bottom acrylic base pieces and brought the file over to SYN Shop for cutting. Adobe Illustrator file for laser cutting the top of the Delta frame. 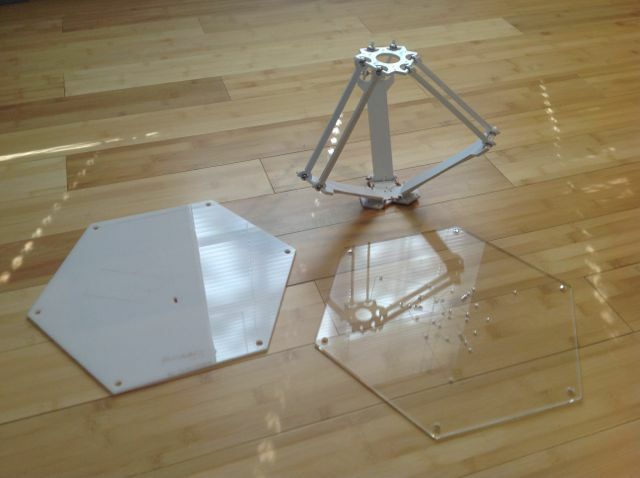 Laser cut pieces and the delta frame ready for assembly. 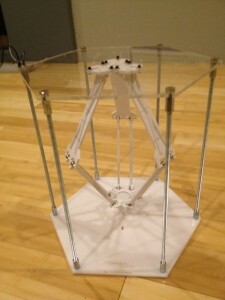 I used threaded rods at each of the 6 hexagon corners to hold the top and bottom pieces together. 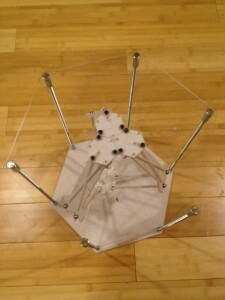 Assembled delta frame with arm hanging down. I used ViaCAD to create the mounting brackets for the servos and 3D printed them out. I ended up doing five revisions to get it right. The blue shows the servo mount. 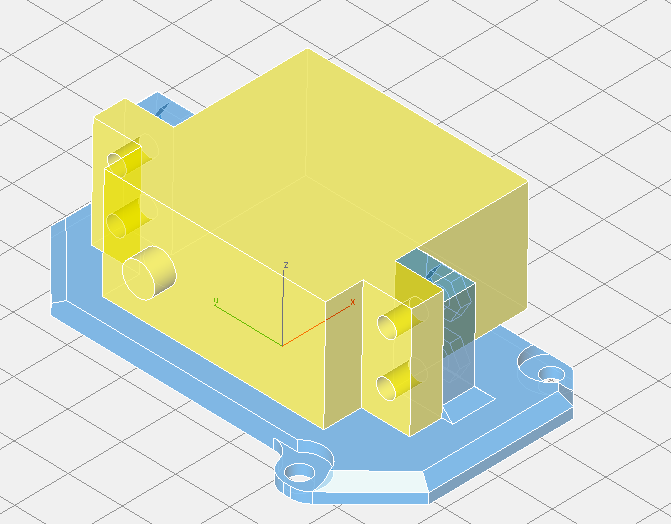 The yellow is the mock-up of the actual servo. 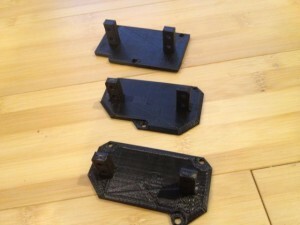 Various revisions of the 3D printed servo mount. 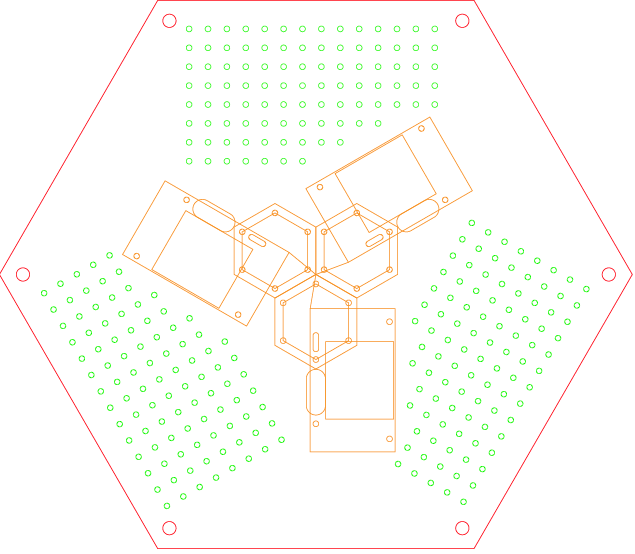 During the process of adding the servo motors I had to re-cut the plastic top to get a better fit for the servos, but also added a few hundred holes in a grid pattern to allow mounting of the electronics as needed. I picked up three standard servos at Pololu.com. The servos are mounted into the new brackets and there are steel wires attaching the servos to the armatures. 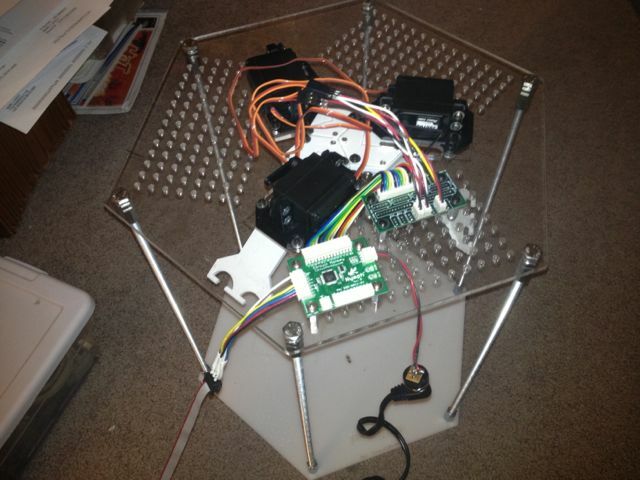 The motors are in the mounts and attached to the Delta frame. Next I started adding the electronics. I installed a Nymph board and a RobiCon connector fan-out board. Added the Nymph and connector fan-out. My next task was to write code. My first goal was to just get the servos moving to make sure that the way I was driving the actuators was sane. 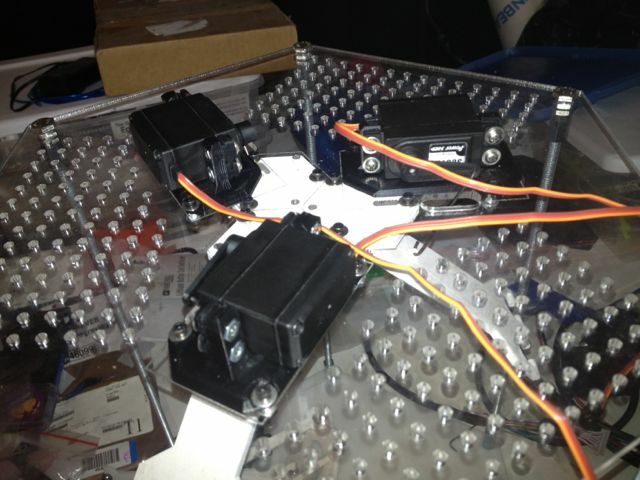 Here is the video below of the servos all being driven up and down in “thrust” mode. Next time i will talk about the code that drives the Delta as well as more video showing the delta working.